Recently I’ve been buying more and more ground turkey instead of ground beef, so I’ve been looking for different recipes to use it in. I love stroganoff, but my husband is not a huge fan. I grew up eating the Hamburger Helper version and it was one of my favorite dinners. It was something quick and easy to make when my parents were running in all different directions taking me and my siblings to practice or a game. 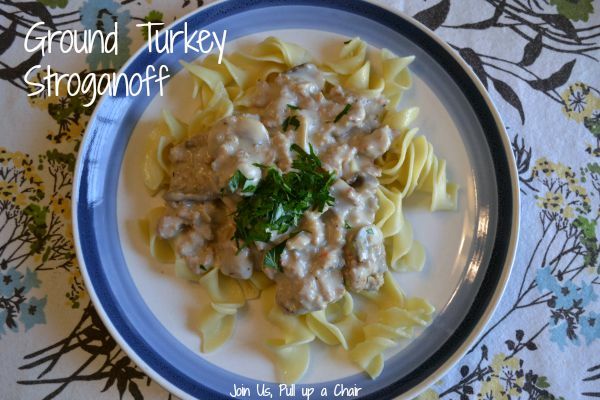 This was a delicious twist on the traditional stroganoff. I added more mushrooms because I only had 1 pound of ground turkey and it worked out perfectly. My kids gobbled it up and it’s another recipe that I can make from scratch. Now…if I can find a quick and easy way to make homemade egg noodles. In a large saucepan, heat the oil over medium heat. Cook the onions and mushrooms for 5 minutes or until they are soft. Add the ground turkey, and cook until browned. While the turkey is cooking, mix to the ingredients together for the seasoning mix until combined. Add to the cooked turkey and stir to coat. Add in the beef broth, milk and mustard to the mixture. Bring to a boil and then reduce heat to a simmer. Cook uncovered for approximately 10 minutes until the mixture had thickened. In the meantime, cook the egg noodles according to the package. Drain the noodles and toss with the two tablespoons of butter. Toss to coat to help the noodles from sticking together. Once the sauce has thickened, stir in the dour cream and mix until well combined. Season with salt and pepper. Serve the sauce over the noodles and garnish with the chopped parsley.